I was totally expecting to find a new queen in Ramona’s hive today after the discovery of the supersedure cell a few weeks ago. Not only was the supersedure cell completely gone, but Ramona was spotted and is alive and well. Does anyone else think that Ramona’s marking looks like a Rorschach ink blot? How does that make you feel? I guess it is still possible there is another queen that I just missed, but I looked pretty carefully. Someone is at least laying well. I’ll check again next week but there were no more supersedure cells in the making so it looks like the hive decided they were happy with Ramona after all. So, what do you think the deal was with the supercedure cells? 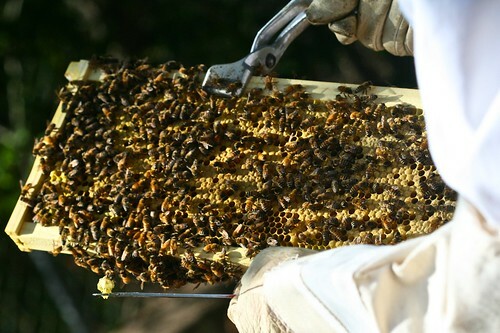 I ask b/c one of my new hives have made similar constructs over the last week. I just put the new bee package in the hive about 3 weeks ago, so they are still new and adjusting to everything. I did not see the queen, even though I looked. I’m sure I could miss her, as I’m new to all of this… I’m also not sure what I should do about it, if anything. Congrats on finding Ramona alive and apparently well! Are you at least seeing eggs? 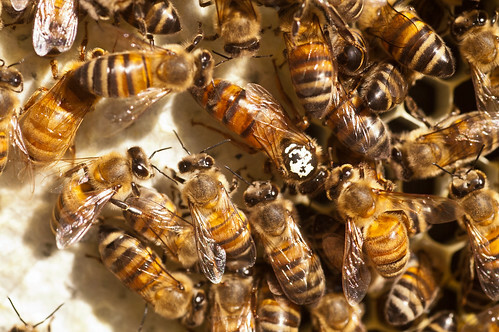 Finding the queen can be difficult especially as your hive grows, but if you continue to find eggs you know your queen is in there somewhere. I would leave the supersedure cells alone for the time being. As I mentioned in a previous post, it did appear one of the queen’s leg was damaged so perhaps she wasn’t initially laying as well as the hive would like which prompted the supersedure cell. Maybe she figured it out and then the hive decided they didn’t need a new queen after all.